Title: Modeling giant extrasolar ring systems in eclipse and the case of J1407b: sculpting by exomoons? Rings have been detected in another Solar system and, just like the rings of Saturn, they may have been carved out by exomoons. For more than twenty years we’ve known of the existence of other Solar systems; we’ve found thousands of wacky star-planet, star-planet-planet, star-star-planet systems. So many, in fact, that they’ve started to become a little pedestrian. Oh, you’ve found another exoplanet? Not another hierarchical triple? Yawn… But this system wins the ‘interesting award’: It has rings, or, to quote the authors, an “exosatellite-sculpted ring structure”. Figure 1 – the light curve of J1407 seen by SuperWASP in 2007. The panels shows the data (red) and one of the models that was fitted to the data (green). 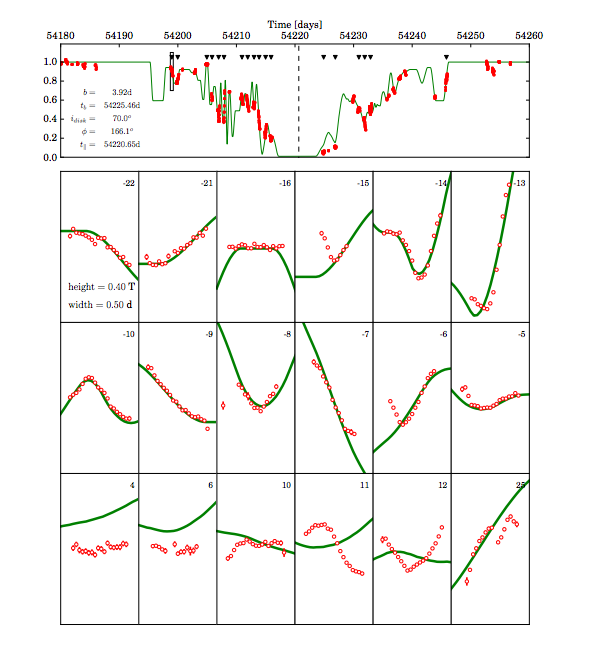 The top panel shows the entire light curve and the lower panels show snippets of the light curve at the positions marked by the black triangles in the upper panel. The model doesn’t do a perfect job of matching the data – this is a pretty complicated model with lots of free parameters, so it’s a really tough problem to solve! Unlike a normal exoplanet transit, where a dark disc (a planet) passes in front of a bright disc (a star), producing a simple, single dip in brightness, these astronomers observed a very different phenomenon back in 2007. 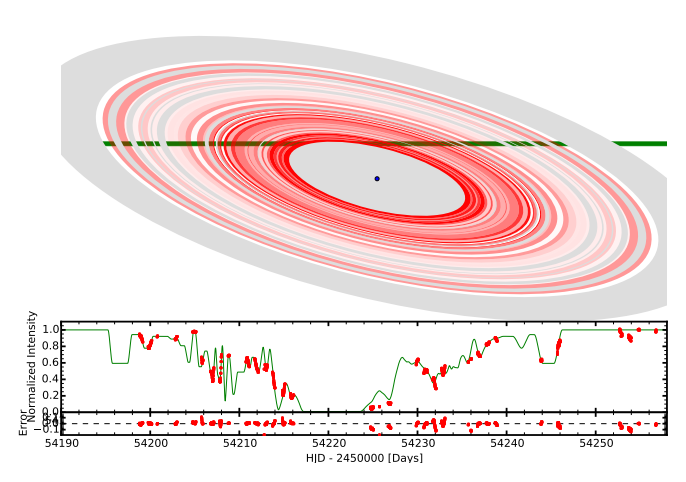 Several deep dips in the brightness of the star ‘1SWASP J140747.93-394542.6’ (J1407 for short), were observed by the SuperWASP telescope, one after the other, lasting a total of 56 days. These dips clearly weren’t caused by an exoplanet occulting J1407, they were too irregular and too long in duration. The authors of this original discovery paper suggest that they were caused by a huge disc of material that orbits another, unseen star or planet, which in turn orbits J1407. It was this disc that passed in front of J1407, blocking 95% of it’s light and Kenworthy et al. postulate that the series of dips was produced by ring-like structure. 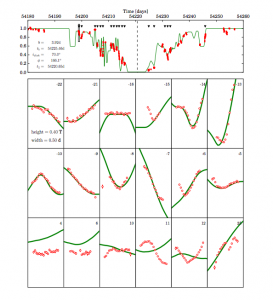 The light curve is shown in figure 1. Kenworthy et al. used the following model to describe the system: two objects, one without rings (star A) gets transited and one with rings (object B) does the transiting. I’m being deliberately ambiguous about the nature of object B, the reason for this will become clear. The authors used the information in the light curve (the change in brightness of star A over time) to build up a picture of the disc. As object B’s disc passed in front of star A it blocked some of its light. Not all of it though—the disc is translucent and some light got through. The amount of light that managed to pass through the disc is called the ‘transmission’. Different rings in the disc have different densities and therefore different transmission levels. Kenworthy et al. used this fact to model the rings using the light curve. The most important information was encoded in the slopes within the light curve, i.e. the rate of change in stellar brightness. Think about a disc of semi-opaque material, slowly advancing across the face of star A. The amount of light you’d see coming from A will slowly decrease as the disc advances, until it is entirely eclipsed, so a downwards slope will appear in the light curve. Any change in slope marks a moment when a ring edge either begins or finishes its transit of star A (the star gets dimmer faster if a more opaque section of the disc moves in front of it). So the number of changes in slope corresponds to the number of rings! Figure 2. A Diagram of one of the ring models. The redness of the rings corresponds to transmission; more light passes through redder rings. The green line shows the path of star A as it is transited by the rings. Unfortunately, since SuperWASP is a ground-based telescope it can’t observe the stars during daylight (only space telescopes like Kepler get that luxury). As I mentioned before, the total transit event lasted 56 days so, obviously there are some gaps in the data. Around 56 of them. This means that Kenworthy et al. can’t count every ring, they can just put a lower limit on the number. They count at least 24 ring edges but suggest that the real number is probably higher. The authors don’t find a unique solution to their model (several ring configurations are consistent with the data). However, they find that gaps between the rings (i.e. actual empty space between the regions of different transmission levels) are supported by the data. One of the ring models that was fitted to the data is shown in figures 1 and 2. What about the mysterious ‘object B’? Well, since only one transit was observed, the authors can’t be sure that B is actually orbiting A: it could just be wandering through space and happened to pass in front of A. Assuming, however that B does orbit A, Kenworthy et al. place an upper limit on its mass: 24 times the mass of Jupiter. This upper limit is the mass of a brown dwarf, something in-between a planet and a star. The authors offer a explanation for the creation of the gaps between the rings: they were “sculpted by exomoons”. This is exactly what happens in the rings of Saturn. Gaps in the ring structure are produced by moons which carve out a path via gravitational interaction with the disc material. They are called “shepherd moons”, because they ‘herd’ the disc material. Although this paper provides tantalising evidence for the existence of exomoons, until we detect one directly we won’t be able to confirm their presence in any Solar-system other than our own. Still, the idea behind this paper is pretty cool, even if the conclusion is a bit of a stretch. The hunt for exomoons continues…. Great article! Is there a current assumption about how common planets/brown dwarfs with rings around them are? Naively, it seems like it would be really interesting and say a lot about our solar system if Saturn and this object were anomalies. Do you think we haven’t found more because they aren’t that common or is it due to some observational bias? The authors’ use of photometry / light transmission makes sense to determine the number of rings. Would it be possible (or has it been done in another paper before) that one could use this data in combination with other information like spectroscopic data to determine the ring’s composition? It seems possible but I don’t think SuperWASP has the capability. Also, since there was only one transit we would have to wait for another transit, if another happens. Given that moons are so common in our own system, is there any particular reason why exomoons have not been detected yet, besides the fact that they are too small compared to plantes and stars? I agree with Chris – it’s awesome that the rings are perpendicular enough to our line of sight that we can resolve them. But now I am wondering about resolving exomoons – is it believed that SuperWASP as a good enough resolution to actually resolve such small features?